The title of this exhibition is taken from a poem by actor and writer Dudley Sutton - a lament for the physically demanding work of the art handlers at the Tate Gallery (now Tate Britain). Prior to Sutton’s poem, the musician and artist George Melly had altered the words to the popular 1926 music hall song “Don’t Have Any More Mrs Moore”, and whilst there is a comedic aspect here, the underlying narrative remains that Henry Moore was an artist whose fame had surpassed the professional art world and entered popular consciousness. Moore (1896-1986) has had a long-standing and important relationship with Chelsea School of Art, first as Head of Sculpture from 1932-9, and latterly through the School’s acquisition of his sculpture Two Piece Reclining Figure 1 1959. 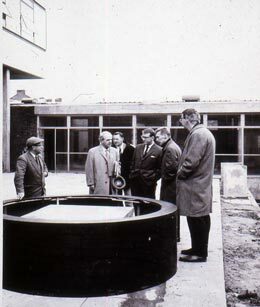 The internationally renowned library and Special Collections at Chelsea (now called Chelsea College of Art and Design) contain original photographs of Moore installing the sculpture at the new Manresa Road site in 1964, plus detailed documentation leading to the purchase of the sculpture, minutes from meetings, a small unsigned sketch, unattributed but possibly by Moore, from 1963 and even plans for a motorised revolving plinth! 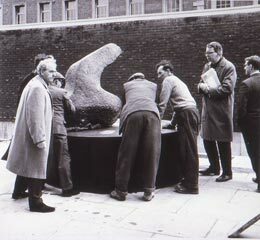 This said, the centrepiece of Chelsea College of Art and Design’s Henry Moore archive is the bronze sculpture Two Piece Reclining Figure No.1, 1959, consisting of two abstracted forms, later attached to a large steel disc. The sculptor wrote of their objectivity; "Once these two parts become separated, you don't expect a naturalistic figure; therefore you can justifiably make it like a landscape or rock"
The sculpture itself is well travelled, moving from Manresa Road to the Tate Gallery in 1968, the Royal Academy in 1988, and further afield to the Jeu de Paume, Paris in 1996. 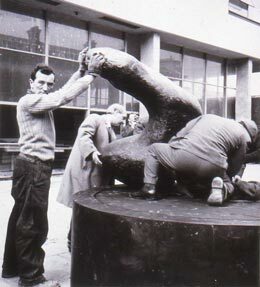 During Chelsea College of Art and Design’s transition to Millbank the sculpture resided at the Yorkshire Sculpture Park, and finally returned to the college in 2010. The bronze elements of Two Piece Reclining Figure 1 1959 will be shown in CHELSEA space on it's wooden transport pallets complete with straps and blankets - a work in transit. This is a prelude to the sculpture being permanently sited in Chelsea's McGregor Courtyard on Atterbury Street opposite Tate Britain's west lawn. The archive includes photographs of the work being installed, removed, and returned, and presents unique documentation of changeable art handler fashion - from flat cap to hard hat and tweed jacket to high-visibility vest. Through these materials, accompanied by a text by Natasha de Samarkandi, CHELSEA space explores not only of the life of the sculpture but also those who encountered it and aided this journey.